After 22 hours of research, testing, and gluttony, we have concluded that Shin Ramyun is the best spicy instant noodle (Korean ramen edition) in the US. I thoroughly enjoyed each ramen as they constantly kept me reaching for more. However, Shin Ramyun’s bold, spicy flavor, and the consistency of their noodles from start to finish made it the cream of the crop in this truly tasty battle. 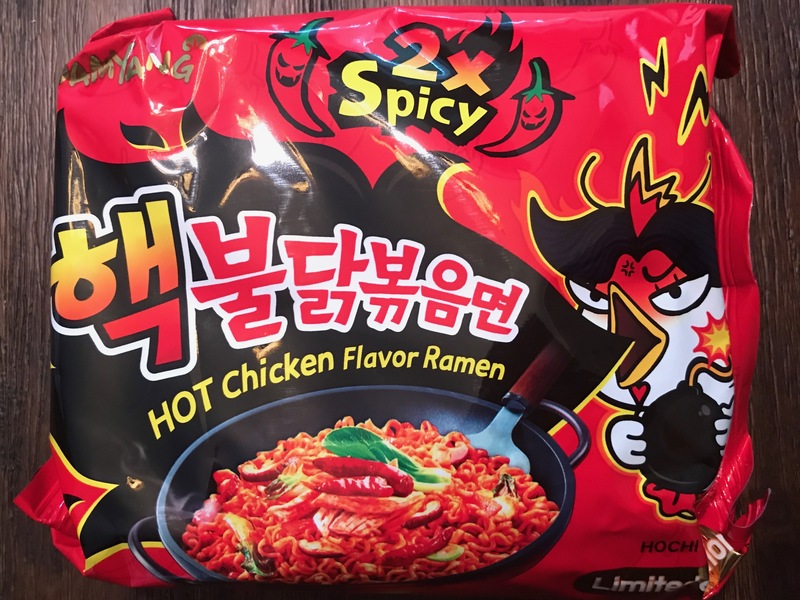 If you’re looking for the best spicy instant noodles coming out of Korea then look no further. 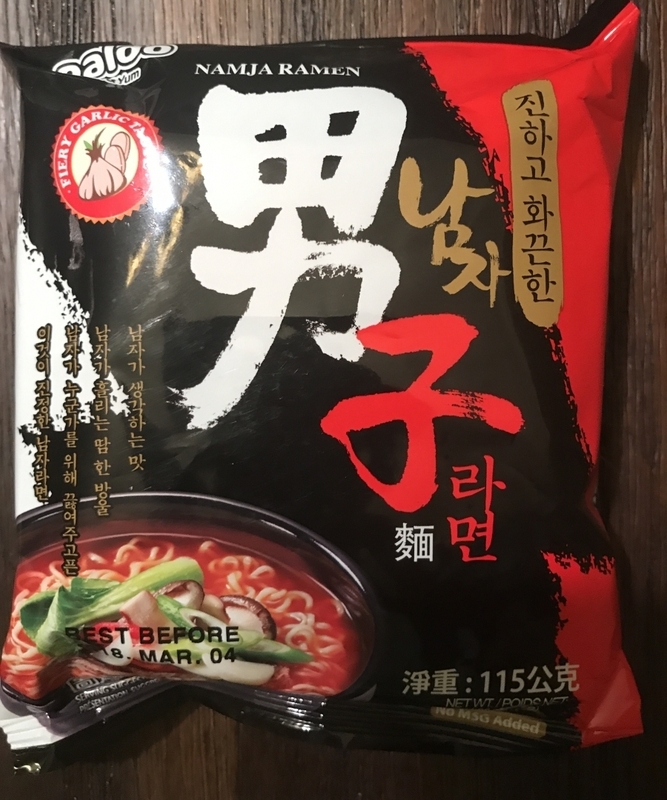 Not sure how much more spicy instant noodles my stomach can handle, but I’m really glad to have expanded the list of spicy Korean ramens to include both Namja and Yeul ramen, with Namja ramen taking the top spot in our rankings. I really enjoyed Namja ramen’s strong punch of garlicky, peppery, and fiery flavors that really made it stand out above the rest. 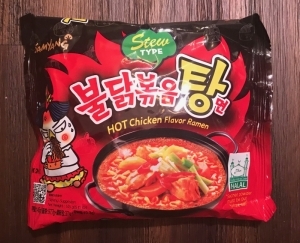 Samyang recently released the “탕” or “stew” version of its famously mouth firing spicy chicken ramen, so instantly I had to give it a try. The stew version doesn’t pack as much heat compared to originals, but its sweet and viscous broth makes it reminiscent of one of Korea’s most popular comfort foods, ddukbokki. 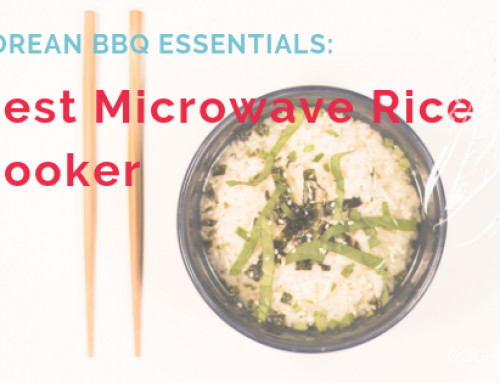 Although it didn’t make it to the top of the best spicy ramen list, it’s definitely worth a try especially if you have some additional ingredients that you want to toss in. Namja ramen epitomizes everything that I want and more in what can only be the best spicy instant ramen. The noodles are pretty comparable to the other instant ramens in this list besides it being slightly thinner, but the star of the show is really the broth. It’s definitely the spiciest instant ramen out of the list and the deep red color of the broth didn’t disappoint. However, there’s more to it than just high spice levels – the broth is filled with garlicky, peppery, and salty goodness that make every bite pretty intense. It’s like a steroid-filled version of Shin and in this case, the bigger and bolder ramen made it to number one in our list. 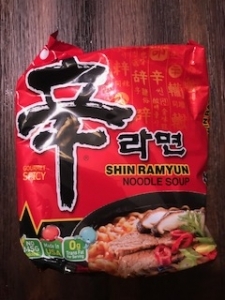 I’m not too sure why Nongshim opted for the less common “ramyun” spelling, but I’m not going to knock them for being a little old fashioned when they’ve been there for the Korean public through thick and thin. I could tell instantly that this ramen was going to be pretty spicy because the broth was a much deeper red compared to the others. This was the second spiciest ramen and it punches you straight in the mouth from the first bite. However, after withstanding the initial spice surge, more nuanced and complex peppery notes came out; resulting in much more than a one tone ramen. Most instant ramens just try to up the heat level and base everything on how many tears they shed and how many taste buds they burn off. Also, while the noodles weren’t any thicker than other ramens’, they maintained their chewy consistency throughout. It also retained its curvy shape even after several minutes of chillin’ in the broth. 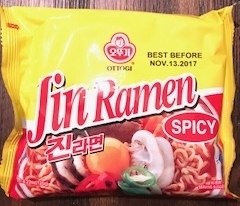 Although the pre-packaged “vegetables” weren’t anything spectacular, the depth of spicy flavors along with the nice texture of the noodles made this my top choice for spicy Korean ramen. Sutah was definitely a dark horse in my eyes and I was truly surprised when it ended up second, I mean my general go to has always been the thicker Neoguri. I was captivated by the super red, volcano inspired broth and the way the heat just keeps on coming. 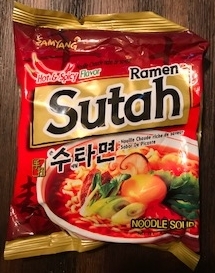 Sutah is one of the spiciest ramen on this list, and when I’m looking for something spicy this really hits the spot. The fire really cuts out any type of greasy or oily mouth feel that came out in some of the other ramens tested. However, the flavor profile is pretty one dimensional and lags behind Shin’s. Side note: the noodles looked a little… distorted. Maybe the water in my neighborhood has some chemicals or what not, but the noodles came out with some weird bubble marks. Despite the off look, there was nothing wrong with them flavor or texture wise. Hit Sutah Ramen up if you’re craving some lava soup. What is Good Korean Spicy Instant Ramen? 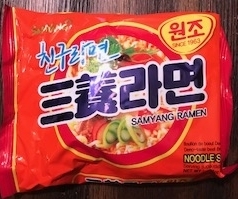 The broth seemed a bit weaker and less spicier compared to the other ramens at first glance, and as it turns out Samyang ramen was definitely the least spiciest out of the bunch. That alone knocked it out from contention for me. The noodles also started to get a bit mushier the longer it remained uneaten relative to the rest. However, it definitely had the most interesting and complex flavor profile out of the bunch. Instead of the typical spicy flavor that I got from the others, the broth had a strong chicken stock flavor. I was surprised to see that it’s actually made from beef broth because I swear it tastes more like chicken. If you’re looking for a less spicy ramen with an interesting flavor profile, I’d give this a shot. The best thing about Jin ramen is the pre-packaged vegetables that it comes with. It has an earthier flavor profile which isn’t surprising due to all the little mushrooms. Besides this however, nothing else really stuck out. It wasn’t as rich or bold as Shin and Sutah and the flavor wasn’t really as complex as Neoguri or Samyang. The noodles also seemed to fall apart the fastest as the original curliness quickly softened up and they became soggy. Jin ramen is still pretty good, but it lacks that extra something that would help it stick out from the others. Neoguri probably belongs more with jjamppong (짬뽕) instead of ramen, but I couldn’t resist testing this out with the others. 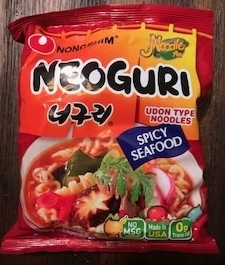 Unlike the other packages it has a nice seafood type flavor enriching the broth with a surprising amount of depth for a midnight snack. It also comes with the freshest looking dehydrated vegetables paired with large chunks of seaweed (one of my favorites). However, it comes out oilier on the palate than Shin and Sutah because there’s not enough spice to cut through the grease. I do like the seafood flavor, but it definitely needs more of a kick to it. Yeul literally translates to fever and there’s really no better way to describe this ramen than to a fever. The spice level initially wasn’t too bad even though the broth had a slight habanero-like flavor to it. But like a fever, it slowly creeps up on you until it’s too late and your either glistening in sweat or reaching to quell some of the slow burn in your mouth. The noodles are slightly thinner than Shin ramen but still maintains that chewiness that you’d expect in any good instant ramen. It didn’t beat out the Namja or Shin due to the lack of depth in flavor – it definitely wasn’t as bold, peppery, salty, etc., as those two. However, it’s definitely worth a try especially if you like spicy food as it was one of the spiciest in this list. I liked it… it’s just not what I expected it to be. The first thing that comes to mind is ddukbokki. The soup base is viscous (probably why it’s a tang/stew), the noodles are much thicker, and the taste sweeter than the other ramen brands I tested. Honestly, replace the noodles with rice cakes and I probably wouldn’t have been able to tell the difference. It’s easily not as spicy as its stir-fried counterparts, but still packs a nice punch. The sweetness neutralizes some of the spiciness so you’re mouth won’t be on fire. There’s also a good amount of garlic flavor (which I love) that comes in one of the packets. The noodles are much thicker but it soaks up a lot of broth so make sure not to wait too long. However, what makes this spicy chicken ramen brand awesome is that it’s a perfect vehicle to add in whatever additional ingredients you want. Just the next day I added in odeng, sausage, cheese, and bean sprouts, and it really just took it to another level. Unfortunately for this review, I judged only on the original ramen content itself, but if you’re feeling creative, this is a great bet. 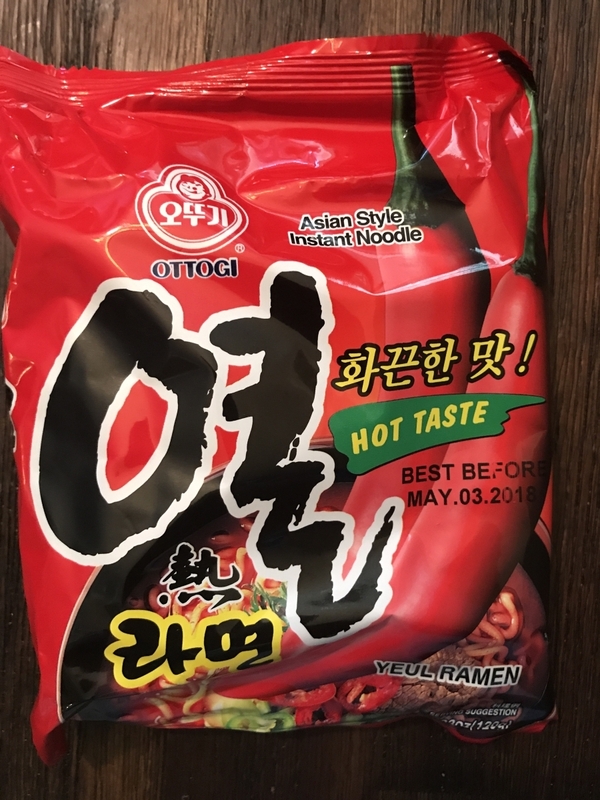 This wasn’t a part of the taste test as it’s not ramen (I know what it says on the package but this is meant to be eaten without broth), but if you are looking for some insanely hot Korean instant noodles, try out Samyang’s Buldak Bokkeum Myun x2. I thought I was pretty good with spicy food, but this immediately makes me want to crawl into a corner and cry. I usually only put about 3/5 of the spicy sauce and fill it up with other side ingredients (e.g. rice cakes, odeng, etc). I don’t know why I put myself through this and my wife was laughing at me the whole way through, but if you’re up to the challenge definitely try this out. Don’t forget that I warned you though. Honestly, there is no better drunk food than instant ramen (and mine needs to be spicy). Every slurp is a taste of heaven, the broth warms the soul, and the noodles sober the mind (don’t quote us on that). But spicy instant ramen is much more than something you crave at the end of a long night, its affordability and convenience has made it a college dorm staple and a fixture in pantry shelves around the world. Ever since Momofuku Ando invented the instant noodle in 1958, it has become a global phenomenon with everyone putting their own twists and spins on the OG. Just check out this list of twelve unusual ramens and you’ll get a taste of the ramen hysteria. South Korea’s passion for spicy instant ramen is no exception and probably on another level than most other countries. In fact, South Korea has the most consumers per capita of this wonderfully sinful dish. Korean instant ramen generally tends to be much spicier so for those who can’t handle the heat be wary. Sold and consumed almost anywhere you can find them in individually wrapped packages or in styrofoam cups (aka cup ramen). Although several studies have been critical of instant ramen’s nutritional value (or lack thereof), South Korean life expectancy far exceeds the average American life span so it can’t be all that bad… right? Not only is instant ramen cheap, affordable, and tasty, it’s an indelible part of Korean and Korean-American culture. The first thing most Korean boys learn how to make is instant ramen and most of them probably go through life without learning how to make anything else (or make well at least). From the first time you learn how to break up the noodles, sprinkle the flavoring pack on top, and eat them like chips, to the first communal pot of ramen on the floor with your friends, to the first pot you share with your significant other; spicy instant ramen is the soju of the food world… much more of a cultural and life experience than a cheap food product. 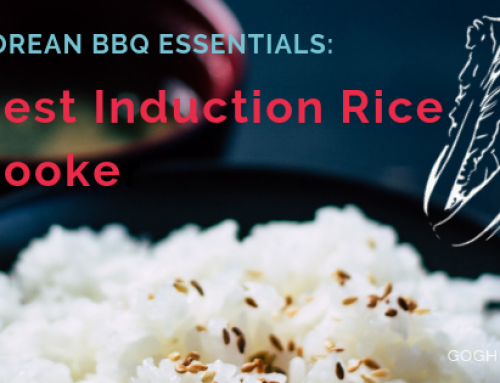 We’re not kidding ourselves, most people aren’t looking at a package of instant ramen and thinking of culinary integrity, but it would be impossible to look at Korean and Korean American food culture without the reliable package that’s there for everyone… and I mean everyone. What is Good Korean Instant Ramen? Although they share the same name, nobody would seriously compare instant ramen to actual ramen shops that cook their broth for days, use fresh noodles, and put a couple fatty slices of braised pork on top. Instant ramen is meant to be eaten on the floor of your college dorm with your friends, at night after being drunkenly thrown together, I’ve seen people pour boiling water straight into the bag while on a fishing trip. But that doesn’t mean they are all the same, and that you can’t expect some level of quality from your favorite package. So what determines whether a Korean instant ramen is good or not? When you only have three main components they all need to shine in their own right. The seasoning and flavors in the instant soup package paired with the dehydrated vegetables need to produce a vibrant and fortifying broth, while the noodles should soak up all that flavor whilst maintaining the chewiness that tells you you’re eating something. The noodles should be “al dente” and maintain its structure throughout your entire meal. You don’t want noodles that immediately mush up like baby food. Obviously, flavor wise for this test we’re looking mainly at how spicy the ramens are, but we’re looking much further than the initial burning fire. Spiciness is not a one trick pony, it can add complexity and nuance all of it’s own, think of the fruitiness of a jalapeño or the vinegar punch of Tabasco. All of that needs to come together into one soul restoring, drama reducing, and hunger abating bowl that is miles ahead of the competition when comparing the time and effort put in with what comes out. I’m not a food expert or a ramen connoisseur, but since I haven’t seen any Master Sommelier certifications for ramen broth I’m not exactly a lightweight either. I’m just here to give my honest opinion of a dish that has been with me throughout my life and always takes me to grandma’s house. Additionally, the purpose of this test isn’t to develop an individualized opinion of each ramen, but to compare and contrast in the hopes that you can find what fits best for you. I conducted a blind taste test of some of the most popular ramen brands. My wife cooked each ramen per instructions, placed a few chopsticks worth of noodles in a small bowl, three table spoons of broth, and placed the pre-packaged ingredients on top. Nothing was excluded from the package and no outside ingredients were added. The noodles were cooked at different times to ensure proper texture, and I tested the noodles after it had sat in the broth for a few minutes to check structural integrity. 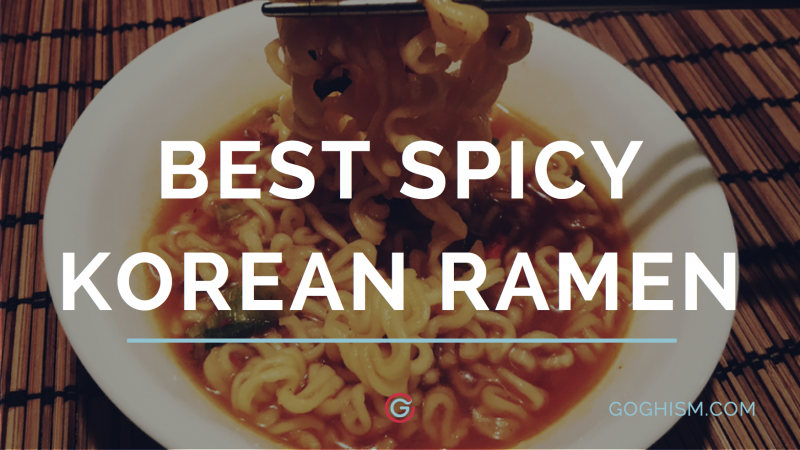 We chose five of the most popular Korean spicy instant ramen brands that can be found in Asian grocery stores in the United States. I’ve also seen some of these brands pop up in popular grocery chains as well. Qualifications were simple – Korean, spicy, and ramen (although Neoguri is technically jjampong style it’s definitely part of the Korean instant ramen canon in our minds). Results of our research listed out per product/brand. There are so many different brands and types of Korean spicy instant ramen out there that I was too worried for my health to test them all out at the same time. However, we’ll continue to bulk up this list in conjunction with my healing stomach. If you have any favorites or mystery boxes that you want to see on this list definitely hit us up. We will also be testing out other types of Korean instant noodles so be on the look out! Some people don’t even consider Korean instant ramen to be real food, and we’re not trying to move people from thinking otherwise. We know where instant ramen stands in the food pantheon and the standard pantry. But I also have my personal favorites and no matter how it may be looked down upon it’s always been something I’ve loved to eat. With all of that, I was pleasantly surprised that there actually is a high level of variation among instant ramen brands (aside from just how spicy it is), and there is more depth and nuance within each than I ever expected. It’s gratifying to see how when you actually take the time to take things slow… or eat more slowly… that something I’ve probably eaten a thousand times can show me something new.